Hello everyone! So is it just me or do you too feel like Christmas morning every time one of the amazing independent pattern designers out there release a new pattern? So many new awesome releases happening currently and I'm feeling more inspired than ever. I thought of sharing some of my favorites here for you to see and hopefully you'll be as inspired by them as I am. So first of all, I'm sure you all know by now the amazing Papercut patterns. I think this is one of my favorite pattern companies currently. I love their designs and how modern they are. And I think they suit my style perfectly. Recently they released their newest collection,"Constellation". I love every single pattern in this collection, but the ones that stole my heart away were the Rigel Bomber and the Saiph Tunic. I'm searching for a bomber pattern for ever now, so when I saw the Rigel I was beyond happy. You should check out Sophie's amazing version of the Rigel Bomber! For me the Saiph tunic is the perfect easy, comfortable winter go-to garment paired with leggings or skinny jeans. Another amazing release is from Colette patterns, their newest collection Walden. It is originally a specialty line of men's patterns, but really I think the patterns are unisex. It consists of three patterns, the Albion duffle style coat, the Cooper bag and the already existing Negroni shirt. Albion and Cooper was just love at first sight for me. I love the classic style of the Albion and everyone knows that I am a sucker for a nice backpack. But the Cooper pattern is not just a backpack, it's actually a pattern with 3 alterations for 3 different types of bags, a messenger bag, a backpack and a satchel. You already know the ByHandLondon girls and their lovely patterns. They just released another awesome pattern, the Georgia dress. It has fitted cups, a panelled skirt and two variations for the straps, one with slinky shoulder straps and one with a wider, nautical style faux collar. The perfect holiday dress or what? And of course you all are familiar with Grainline studio. Everytime Jen releases a new pattern my excitement can't be described. Perfect, wearable patterns with very nice instructions. 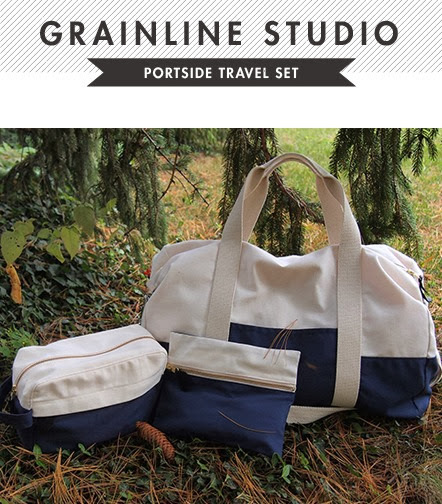 This time she released a different pattern, the Portside Travel Set. A travel set that consists of a duffle bag, a travel pouch perfect for smaller objects and a roomy dopp kit. Perfect for weekend getaways and short trips. So these are some of my current favorites patterns! Do you guys like them? Have you already made any of these?